After two weeks in Nepal it was time to move out of Kathmandu and say goodbye to Megan. Before we left her, Megan let us know that there were strikes called for the upcoming Sunday and Monday. 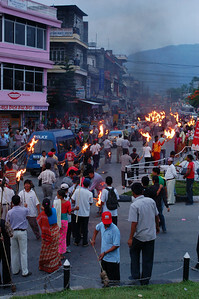 Strikes (locally called bandhs) in Nepal essentially paralyse transportation with nothing other than possibly rickshaws and pedestrians being allowed to circulate. So we took a bus for the touristic town of Pokhara having decided to skip the previously planned stop in Bandipur, since we wanted to exit Nepal to resume our fast-paced traveling. This allowed for two days in Pokhara, not much, but enough to see it. The bus ride to Pokhara winds through valleys of rural Nepal and was very pleasant minus the heat and the bus stop at the extortionately priced tourist restaurant. Entering Pokhara we noticed a group of villagers sporting red caps imprinted with the letters "YCL", they were gathered around a statue in the center of town. Since we arrived in Nepal, the YCL had appeared on the front page of newspapers almost daily. The YCL, or Youth Communist League are a sister organization of the Maoists and seem to be favorite target of the local English newspapers. Judging from their most recent activities: pelting a UN jeep carrying the American ambassador with rocks and kidnapping a Nepali wanted on fraud charges and delivering him to police, a more appropriate name for them could be the "Young Communist Vigilantes". While we were in Kathmandu the current prime minister Koirala publicly called them the "Young Criminal League" creating quite a political stir and prompting many reactions from the Maoists. With elections coming up this year, Nepal is going through very interesting times. The elections will determine the Constituent Assembly who will then put together the country's new constitution. 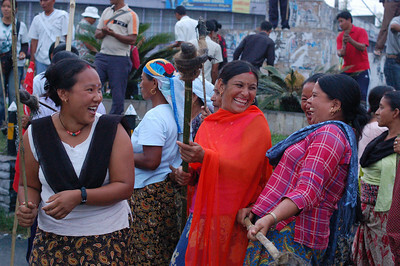 Every group in Nepal, especially minority groups are trying to make their voices heard, to guarantee themselves a favourable place in the constitution. Exiting the real Pokhara and entering the tourist zone, we left the politics behind and found a lovely guest house with again very reasonable low season prices. We relaxed for a few minutes in our room and decided that the first order of business was to book our tickets for the Indian border for Saturday, knowing that Sunday and Monday we would be stranded by the strikes. While surveying several travel agencies to find the best price we learned that there was also a strike on Friday and possibly on Saturday. As usual, no one actually knew anything for sure, but some agencies weren't selling tickets for Friday or Saturday, which was a bad sign. It was Thursday afternoon, if we didn't leave that day we wouldn't be able to leave Nepal, let alone Pokhara for five days. After brief debate we decided it was better to get to the Indian border before the strikes started and the only out of Nepal was a dreaded night bus leaving only a few hours later. 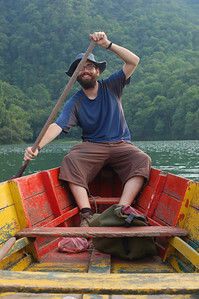 We had come all the way to Pokhara (not exactly on the way to the border) and before leaving we felt we should at least accomplish the major tourist activity in town, a boat trip on Phewa Lake. With time running out before departure time, we rented a boat for an hour. Emilie's paddling skills were somewhat inadequate, so we didn't manage to get very far. With my criticising Emilie's paddling and the fact that for some reasons we had the heaviest paddles on earth, Emilie quit and let me row us back to shore. So, an hour in the boat proved to be more than enough for us. After the boat ride we quickly ate dinner, picked up our backpack at the hotel, hailed a taxi and headed for the bus station. The bus station sits right next to the statue occupied by YCL members earlier. On arrival there, we noticed that there was nothing left of the statue. 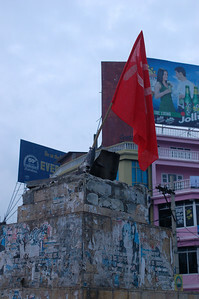 All that remained was the base implanted with a red hammer and sickle flag. A large crowd had now gathered there and as the good and safe travellers that we are, we headed over to the gathering (of course still wearing our backpacks so that we could make an extra fast escape if things degenerated), Megan would not be impressed. We approached the crowd and asked if we could take pictures, protesters immediately began talking to us. We were warmly welcomed and even asked to be part of the procession through the town. Seeing the police close by and knowing to what extent they love permanently pacifying activists we politely declined. We still had a bus to catch. 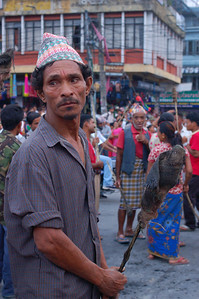 After discussing with an older protester we learned that they just reposessed some land from the royal family around Pokhara and that they were a Maoist aligned group called the Tamuwan Mukti Morcha (TMM). We also learned that the now removed statue was some member of the royal family. We continued to discuss with protesters always making sure to reiterate our anti-monarchy position (and how Canada is still not free of monarchy). While discussing the crowd started getting ready for the procession, with the distribution and lighting of torches. We stood on the remains of the statue and watched the torches disappear down the road. After this brief but highly entertaining Maoist spectacle we returned to our bus and our extra tiny seats and waited to depart on our long journey to the border. Little did we know that the temperature there was hovering around 50 degrees celcius (no exaggerations). 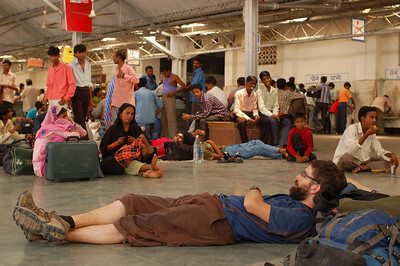 We were at the border by 4:30am and stamped out of Nepal and back into India soon after. But we wouldn't be in Delhi for another 30 hours, that are just too hot and painful to describe. Les maoïstes sont-ils nombreux? Quels est leur pouvoir politique?